I remember when Buss and Vivians were in high school, both scoring well over 40 PPG. Very exciting. Both have helped raise their respective programs significantly. Buss is an iron woman -- #1 in D1 in MPG. So, this game needs to go to double overtime to match tonights games? I'm sad that South Dakota ain't here. they said largest crowd ever. good for the Hoosiers. Angela Beck is the color commentator. 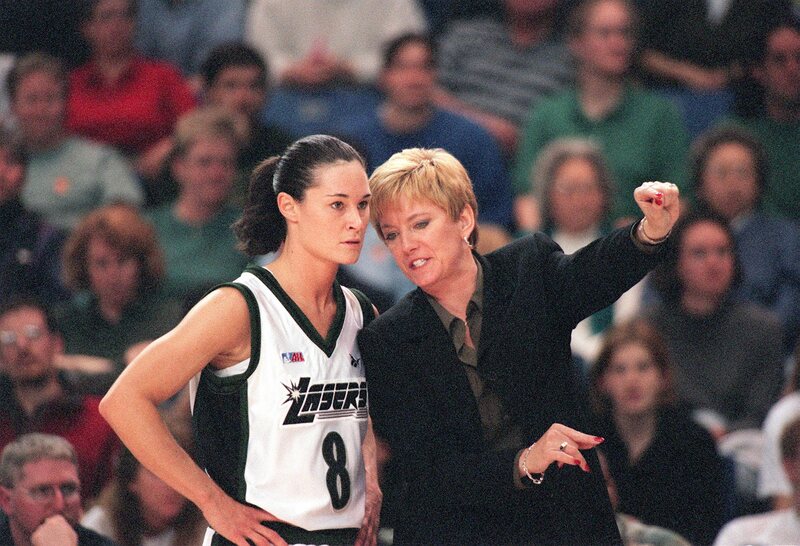 She coached at Nebraska and then went to coach the San Jose Lasers in the ABL. Indiana wins giving seniors Tyra Buss and Amanda Cahill a win in their last game. ok, so convince me that Indy would have preferred getting in to the NCAA, going to Baylor as a 10 seed, and being done on the first weekend....instead of winning a championship in front of 13,000 fans. But what if they were an 11-seed and made it to the Sweet 16, like Buffalo did? Meh. Bigger Trophy, right? LOL. The played longer than any other Big Ten team. I'll miss Miss Buss. Impressed that South Bend TV gave a lot of attention to this game. Did a 60-second segment I'm guessing.